I’m battling a migraine so I’m going to make this quick. 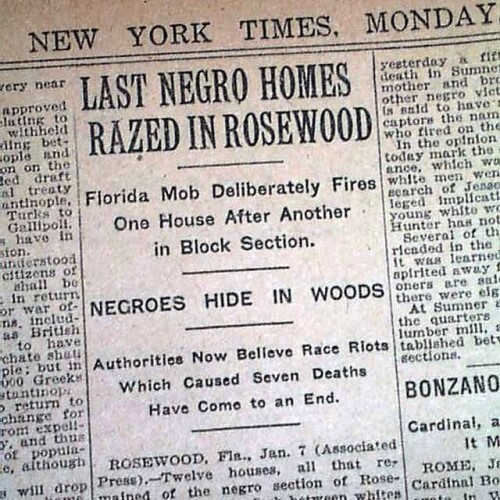 In January 1923 a little town in Florida called Rosewood a massacre occurred. A white woman in a neighboring town made a false claim she was raped by a black drifter. The events sparked from this lie resulted in black’s being hunted down and lynched for about 6 days. Rosewood was a predominantly black town, and the residents left their homes to hide in the woods. Rosewood was literally burned to the ground. They say the casualty count was only 6 blacks and 2 whites. But reports differ, I’ve heard upward 40 or more blacks were hunted down like dogs and exterminated. Look up the movie Rosewood with Don Cheadle, but be forewarned, you will be hurt and pissed off. Racism is wack, let’s do better!